Steve Morgan, Editor-in-Chief. PHOTO: Cybercrime Magazine. 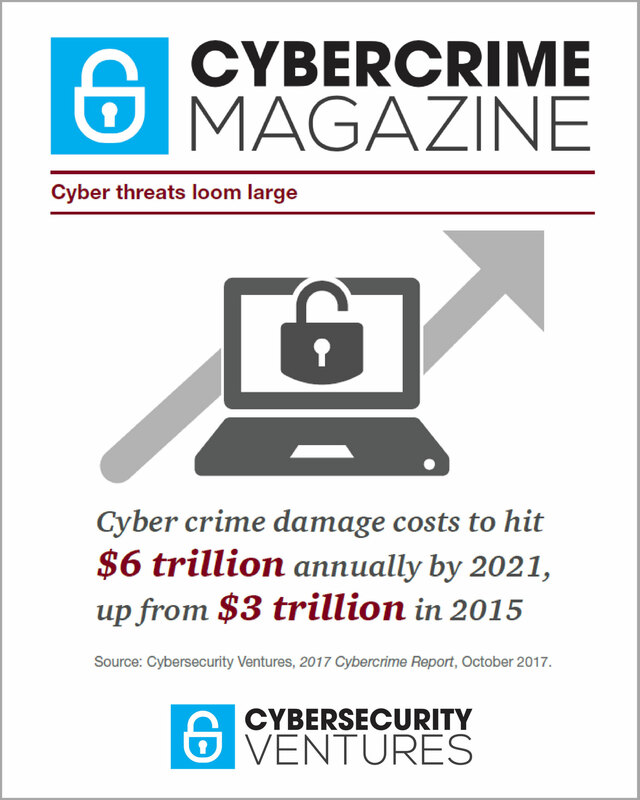 Our team works with an experienced group of editors, freelancers, and media contributors to bring you Cybercrime Magazine. Steve Morgan, Founder & Editor-in-Chief, is a well-respected cybersecurity researcher, journalist, community organizer, and publisher. He heads up all of our editorial and publishing. Steve authors annual reports on cybercrime, the cybersecurity market, and cybersecurity employment – containing de facto standard statistical information which is routinely featured and quoted by major media outlets, professional journals, academia, government leaders, technology vendors, associations, and industry experts globally. Over the past 3 years, Steve has written more than 425 articles for CSO, Cybercrime Magazine, DarkReading, Entrepreneur, Forbes, and others. In 2017, Steve was named by LinkedIn as one of 5 cybersecurity influencers to follow. Managing Editor, is responsible for posting and managing all of our blogs, reports, lists, and community resources. She works closely with our Editor-in-Chief, writers, and contributors. Di also conducts and manages research and compilation for our special projects. Previously, she was an Editor at Sand Hill, a software industry blog and newsletter, for nearly 5 years. Before that, Di was Editor-in-Chief at Airport Journals for more than 9 years, where she interviewed high-profile aviators, and oversaw writers, photographers, news editors, copy editors and proofreaders. rgan, Special Projects & Operations Manager, collaborates with our editors and contributors on various assignments including women in cybersecurity, in-house and on-location interviews, events, sponsorships, and The Phi Beta Cyber Society initiatives. She completed an internship at Code Dx, a cybersecurity software developer which grew from research funded by the U.S. Department of Homeland Security, Science and Technology Directorate’s Small Business Initiative Research (SBIR) program. Kerry received a B.S. in Criminal Justice from the University of Scranton. Paul John Spaulding, Video Production Specialist, films and edits our podcast interviews, events, and other projects. He looks at the ordinary in unordinary ways, breaking stereotyped conventions, and gaining new insights or perspectives. Paul has directed, filmed, and edited numerous productions including radio shows, documentaries, and instructional videos. He was the director, editor and videographer for the documentary short Blackbird, a Woodstock Film Festival Official Selection. Paul received a B.S. of Arts in Digital Media Production from the State University of New York at New Paltz. Steven Kroll, Public Relations Specialist, is responsible for our comms to media outlets, governments, academia, and the entire cybersecurity community. In addition to PR, he’s a staff writer on special projects. Steve spent five years as a high school English teacher at two school districts on Long Island. Before that, he worked in the Office of External Affairs at Columbia University’s Teachers College, where he wrote articles for the website, and earned a master’s degree in English Education. Steve earned a B.A. in English from Stony Brook University. Scott Schober, Senior Media Commentator and Event Speaker. He has interviewed numerous high profile cybersecurity executives, produced and hosted companion videos for our reports, and gone on location in the U.S. and Canada for our live appearances. From interviewing Kevin Mitnick, the world’s most famous hacker, on the floor of The New York Stock Exchange, to filming Robert Herjavec, Founder and CEO at Herjavec Group and a Shark on ABC’s Shark Tank, to announcing our annual Cybersecurity 500 list at the Cyber Investing Summit, Scott has been an important voice for Cybersecurity Ventures. He is author of the popular book Hacked Again. Dr. Jay, PhD, CISO Ambassador, is a member of our Board of Advisors. She’s our go-to expert for feedback on editorial content aimed at C-suite executives, CIOs, and senior information security leaders at large enterprises. Dr. Jay is the Chief Information Security Officer for Xerox and the former Deputy CIO for the White House. She reviews and provides insights to our editors on reports, resources, and interviews that are published in Cybercrime Magazine. Dr. Jay spent more than 11 years as an Adjunct Faculty Member for several well-respected universities, and 6 years as a Cryptologic Engineer at the U.S. Department of Defense (DoD). Connor Morgan, Editorial Assistant, compiles cybersecurity lists for the editors at Cybercrime Magazine. He works part-time during the school year, and also as a summer intern. His editorial compilations include cybersecurity programs offered at universities, community colleges, vocational schools, and high schools in the U.S. Connor is a senior at Northport High School on Long Island where he takes the Academy of Information Technology (AOIT) Introduction to Cybersecurity course. He plans to study criminal justice at Suffolk County Community College.